It seems like the entire world has jumped on the Pinterest bandwagon in the past years, including myself. It’s one of those sites you can spend hours on. “Visual Bookmarking” has made its mark as one of the top new internet trends in the recent years. Either design house, introduce a new recipe or invent something, the news is up to you. Pinterest is available for you to tell the people what you can do better. If you want more platforms to launch your ideas then below mentioned sites like Pinterest are perfect. Thanks to the popularity of Pinterest, there has been a rise in similar websites and apps like Pinterest. There are various free Pinterest like platforms for photographers, designers, food lovers and more. So, if you are looking for a Pinterest-like experience for a particular genre, there are some good enough options from which you can choose. So, without any further ado, here are some websites and apps similar to Pinterest. We Heart It certainly is! We Heart It is a great way to discover inspiration and beautiful images every day. From the moment you visit the homepage, you will notice that it’s indeed aimed at young and college-going ladies. Unlike Pinterest, We Heart It is a more basic experience where you can discover & follow people, “love” pictures shared by others. While it lacks the pinning & boards features in comparison to Pinterest. We Heart It is available for you to sign up with Facebook, Twitter, and email and you can find and follow friends from Facebook, Twitter, and Gmail. You can search by top tags or any keywords, you can install the Heart Button in your browser and submit the images you like, you can create different sets of kinds of images, and you can also heart the images from others. Piccsy is yet another site like Pinterest. Like Pinterest, you need an invite to sign up Piccsy to submit your favorite pictures, but to apply for an invitation, you also need to enter three websites which you are often habitual to looking for inspiration. As a guest, you can only search and view the existing images, and the site was easy to be over capacity during my test today. Dribbble is “Show and tell for designers.“ For all of you creative folks out there, Dribbble is the perfect outlet for you to answer the question, “What are you working on right now?“. Whether you’re designing websites, movie posters, typography, pixel art, company logos, architecture, or whatever else, you can use Dribbble to share your work. This Pinterest-inspired website is not only an excellent place to discover new dishes, ingredients, and recipes for cooking, but it is also a great place to show off beautiful photographs of food. The only downside to FoodGawker is that it’s curated. You can submit your pictures and links, but the editors review all submissions and have the final say on what gets published. The website features tons of beautiful pictures of different dishes with recipes from the community. All the content is categorized under different menus like breakfast, starters, dinner, vegan, etc. You can also check out the “most gawked” pictures. There’s a similar website for drinks as well dubbed Liqurious. FoodGawker is for food lovers. It is for those who have great recipes of every dish in their mind. FoodGawker app is a photo gallery of food recipes. It enables the users to virtually search and explore new recipes, techniques, ingredients and methods to make something new to show cooking skills to others. It is a perfect place for those running food chains and hotels. Dudepins is a third Pinterest-inspired site aimed at a demographic of men. What sets Dudepins apart is its tendency to be a bit classier than the alternatives. It doesn’t have NSFW content (like Manteresting), and it doesn’t have silly Internet memes (like Gentlemint), making it the most mature of the three choices. As the homepage of the site quips, “Discover everything that’s manly.” If you are looking for other sites like Pinterest or Pinterest alternatives for men, the other option is Gentlemint and of course, DudePins but what sets DudePins apart from Gentlemint is its more mature and classy content. If you are looking for some seriously good content aimed at men, you should consider joining DudePins. While Dudepins isn’t a barren wasteland, it hasn’t yet reached critical mass regarding community size, which is a shame because I think it has the best potential for being the truest “Pinterest for men” site on the web. PearlTrees is another site which is very similar to Pinterest but instead of the board & pin concept; it uses a pearls & trees concept. It lets you explore and share different types of content. Once you start sharing content on the platform, you will come across similar “trees.” There are also various trees you can follow and add your valuable pearls to it. Fancy is the platform for searching fantastic stuff and those kinds of stuff that you like most. The unique and easy-to-use platform of Fancy is designed keeping in view the requirements of tablets, phones, and other devices. The core features of Fancy are collecting & sharing, online purchasing, a place for exploring gifts, and much more. If you like buying cool, unique items, you will surely appreciate Fancy. 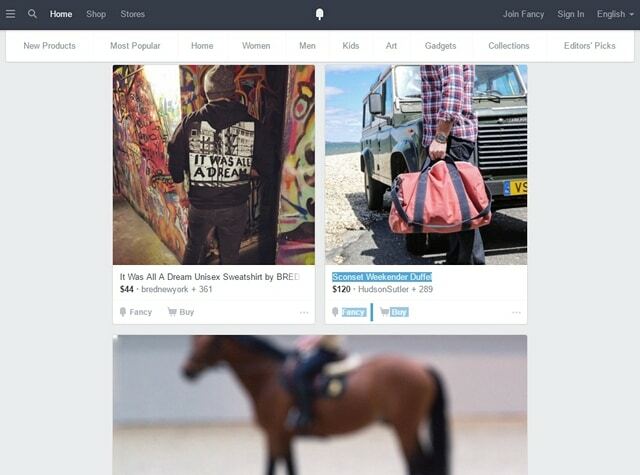 As the name suggests, Fancy brings a curated list of different fancy products in a layout similar to Pinterest. There are a plethora of fresh products, categorized under gadgets, home, art, clothing, etc. The good thing is you can easily buy any of the stuff directly from Fancy, without the need to go to a third party website. Etsy is also an e-commerce site, which brings all the trending products in a format we’re used to from Pinterest. So, you can check that out as well. There are many sites like Pinterest having Pinterest-like platform for your every particular interest, so if you are a fan of Pinterest’s layout or its content curation abilities, then you are going to enjoy these Pinterest alternative websites and apps surely. Thanks to Pinterest that enables the creative minds to discover and create new ideas and share them with rest of the world as well. Pinterest is one of the best platforms to show off your talent, to introduce and express yourself in the globe. Are you an ex-fan of Pinterest who has moved away to an alternative site? Why did you move away and which Pinterest alternative sites do you like the most? Share your thoughts with us in the comments. Previous: How to Make Windows 10 Run Faster on PC?